Author: Denis Creissels. Series edited by: Raimund Kastenholz. 4 pp. Roman, 247 pp. 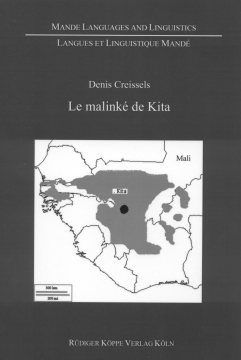 Traditionally spoken around the town of Kita in Western Mali, the Kita-Malinké is a variant of the Manding languages of West Africa. This language group, also encompassing the official language of Mali, Bambara, are part of the Mande family of the Niger-Congo languages. Mutually intelligible and very closely related, they share 90% of their lexicon, the Manding languages form a network of dialects across a large part of West Africa. From Senegal and Gambia, Guinea and Guinea-Bissau, to Mali, Burkina Faso and Côte d’Ivoire and even as far as Sierra Leone and Liberia, Manding languages are understood or used as lingua franca. The language under discussion here is part of the Western Manding languages. A vowel system with five distinctive vowels sets them apart form the eastern variants with seven distinctive vowels. However, the Kita is phonologically the closest to the eastern group. Additional distinctions in the tone system and morphosyntax makes it one of the typologically more interesting dialects in the region. As an introduction to the phonology and morphosyntax of Kita, this publication addresses Africanists, linguists and language enthusiasts alike. With no prior specialization on the languages of this part of the world, it is possible to gain insight into the Manding language family. For the purpose of this publication, informants from Bindougouba, 15 km from the city of Kita, supplied numerous data and language samples. Due to its central location in the Manding area and very sparse language contact with non-Manding languages, Kita remains a very representative member of this geographically diverse language continuum. The book under review is an important step forward in Manding studies: it is the result of dozens of years of work in the field, it suggests original answers to some difficult questions of Mande linguistics, it provides new interpretations of facts, an alternative of views which are often taken for granted, and it puts the Manding data into a general typological context (highly welcome, since this is an overall deficit in Manding publishing). It should be mentioned too that the scope of Creissel’s book by far exceeds the narrow dialectal limits of Kita Maninka [...], his interpretations are very often valid for other Manding varieties as well. In sum, Le malinké de Kita is clearly one of the best grammars of a Mande language written so far, and is an excellent reference source to be used not only by experts in Mande, but also by typologists and general linguists. The grammar is easily accessible to readers previously unfamiliar with Mande languages, and conforms to the highest standards of language description.